Jean Valjean is the central character of Victor Hugo's ever-popular Les Miserables, but we don't really "meet him" until "Book Second" of Volume I. In Chapter VI, entitled "Jean Valjean," we learn about his background (and why he was imprisoned nineteen years). In his early life, Jean Valjean is a tree-pruner, like his father before him. The "peasant family" - so designated by Hugo - is poor and lives in the small town of Faverolles (located in the Brie region of northern France). Jean Valjean, who is named after his father, can neither read nor write before he becomes an adult. His sister, named Jeanne after their mother, is older than her brother and eventually has seven children. Madame and Monsieur Valjean both die young. She develops an untreated case of "milk fever" (called "Brucellosis" ever since its cause was discovered in 1886), and he sustains fatal injuries from a tree fall. After his brother-in-law also dies, Jean Valjean - now aged 25 - is the sole supporter of his family. He does not relish that role. On a winter night in 1795, with worries about feeding seven children (ages 1 through 8) weighing on his mind, the out-of-work Valjean goes to the town of Faverolles. The baker - Maubert Isabeau - hears a strange sound and realizes someone has broken the window of his shop. He catches Valjean who is thereafter tried for breaking the window and stealing a loaf of bread. 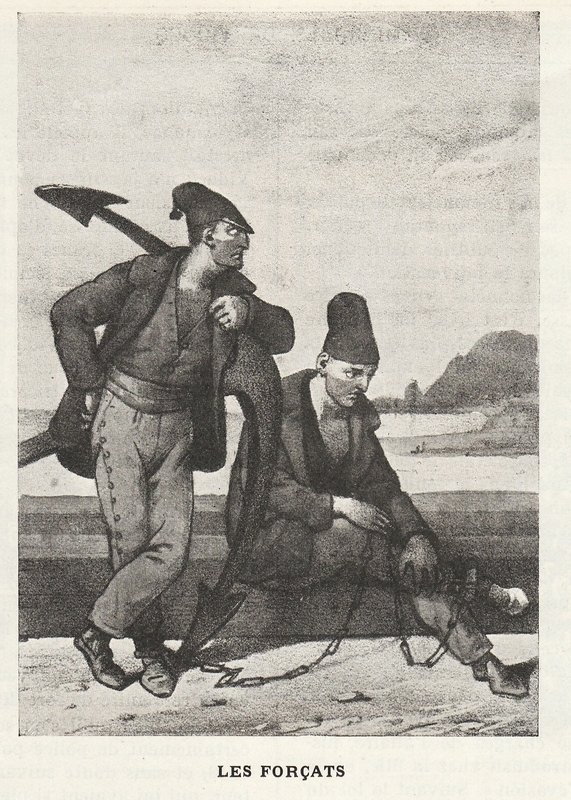 Valjean is sentenced to hard labor - working as a heavily chained galley slave (known as a "forçat" in French) - in the southern port town of Toulon. He is given prisoner number 24,601 and begins serving his term of five years inn 1796. Because he tries to escape several times, fourteen more years are tacked onto his sentence. He is released, on parole, during October of 1815. Victor Hugo mentions the case of another man - Claude Gaux - who was long-imprisoned for stealing a loaf of bread. Before Hugo wrote Les Miserables, he created a character called "Claude Gueux." The work is listed, among other places, in The Publishers' Weekly for September 26, 1896 (see page 536). In this audio clip, Carole Bos reads a chapter from Les Miserables, Volume I - Book Second - Chapter VI (entitled "Jean Valjean"). As you listen, consider these topics. Is there a difference between "helping out" and "taking responsibility?" Is stealing ever justified or excusable? Are prison sentences always fair? Does poverty tend to cause crimes of desperation? Les Miserables, Volume I, Book Second, Chapter VI - "Jean Valjean"
As you listen to Carole Bos in this audio clip, you can follow along by reading the story online. See the translation by Isabella Hapgood (at Project Gutenberg), which is opened to "Jean Valjean." Les Miserables, Volume I, Book Second, Chapter VI - "Jean Valjean" - by Victor Hugo. Read by Carole Bos, creator of Awesome Stories. Bos, Carole "Les Miserables - Jean Valjean, Background - Audio Reading" AwesomeStories.com. Oct 07, 2013. Apr 18, 2019.